Voyages of Discovery Boat TripsA long standing local family company with highly qualified and experienced personnel including oceanographers, fisheries scientists etc. 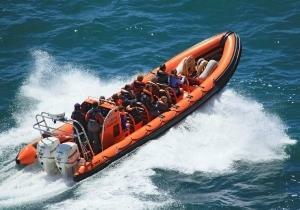 Offering a range of highly guided Voyages from the ever popular inshore Ramsey Islands to the Offshore Islands Whale and Dolphin Watch. CHALLENGER and VIKING EXPLORER are purpose built and maintained to exacting standards. Our vessels offer both inboard and tube seating (which ever you prefer). Navigating into deep sea caves, through gorges and around spectacular cliffs you will observe colonies of birds, seals and porpoises at close hand - a wonderful opportunity for children and photographers. Or try the offshore sailings with frequent whale and dolphin observations. Your expert guide and skipper personally tailors each voyage to your needs ensuring an unrivalled voyage of a lifetime. Depending on the time of year underwater cameras and ultra sound echo sounders may be used and our vessels are now fitted with hydrophones to enable logistical location of cetaceans. Fully Guided Premier Marine Wildlife Tours. A long standing local family company with highly qualified and experienced personnel including oceanographers, fisheries scientists etc. Voyages Of Discovery Boat booking Office.